Hi, my sweet friends!! 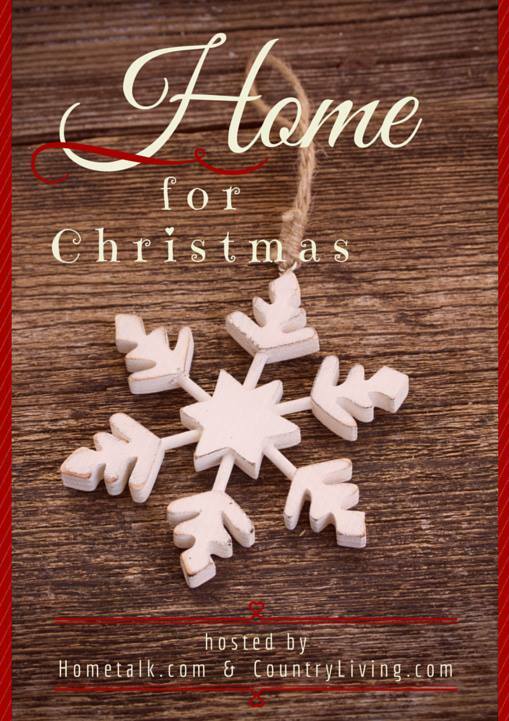 Welcome all to our Home for Christmas Blog Hop!! I’m so excited about being part of a Christmas Blog Hop on my first year of blogging! This year we have been honored to have both Hometalk.com and CountryLiving.com as our hosts!! If you’ve been following me for some time you know I’m crazy about recycling. I love to make pretty things for my house, but it doesn’t mean I can not upcycle something I have around here or make something on a budget. 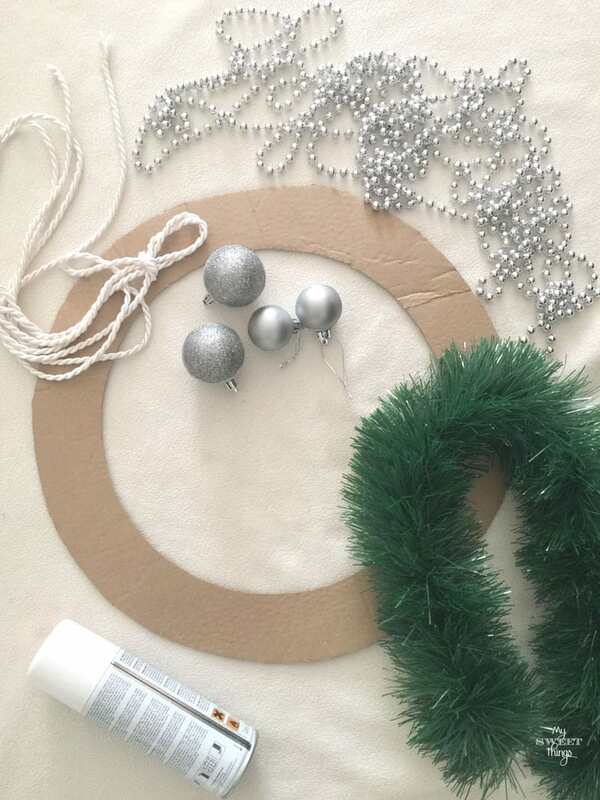 Christmas is a great moment for that because everything with glitter looks way better, don’t you think? 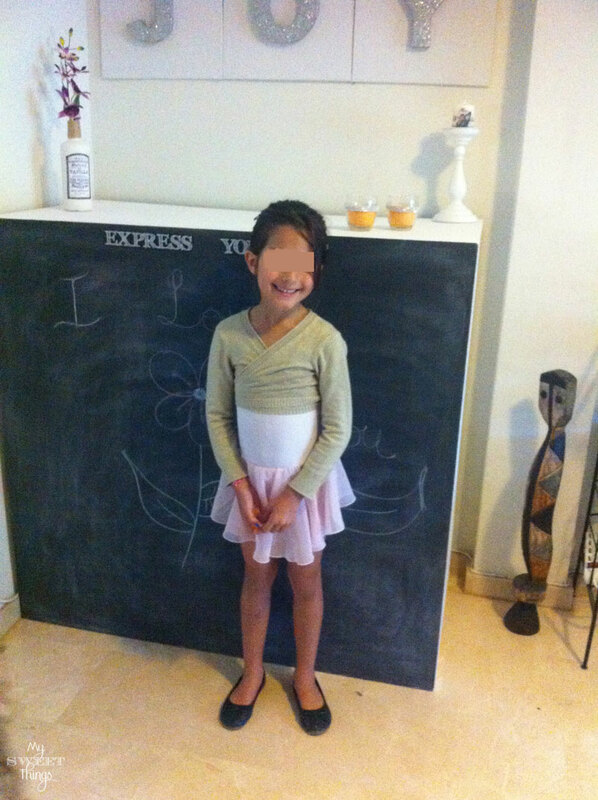 It happens that we have a big chalkboard in a corner of our living room which hides a monster behind it, but that will be another post. That corner was a bit dull for me, not for the kids that come home to play with the girls, and I decided to cheer it up. 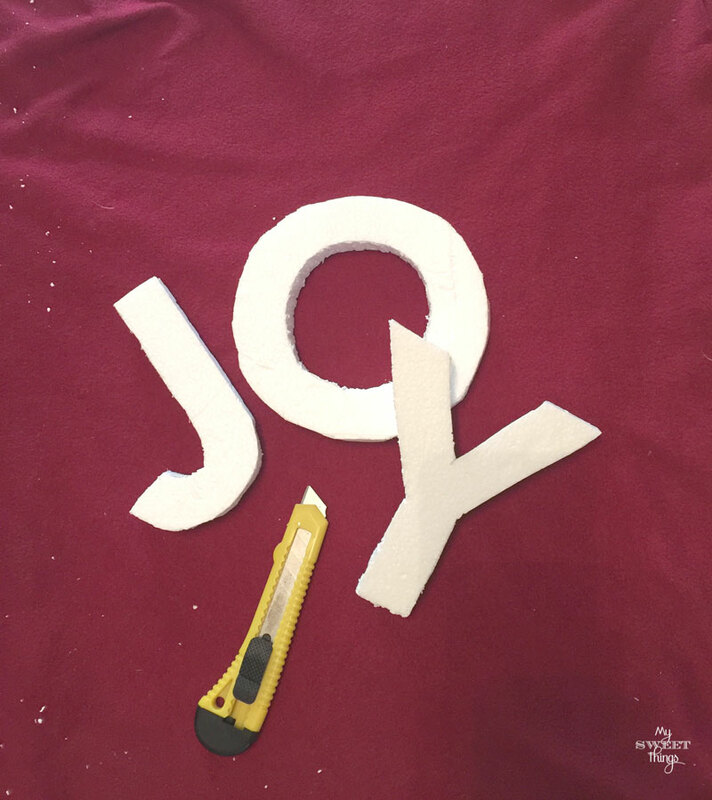 The first thing we did was a DIY joy sign. It was really simple, we used some styrofoam, cardboard, fabric, glue and glitter. 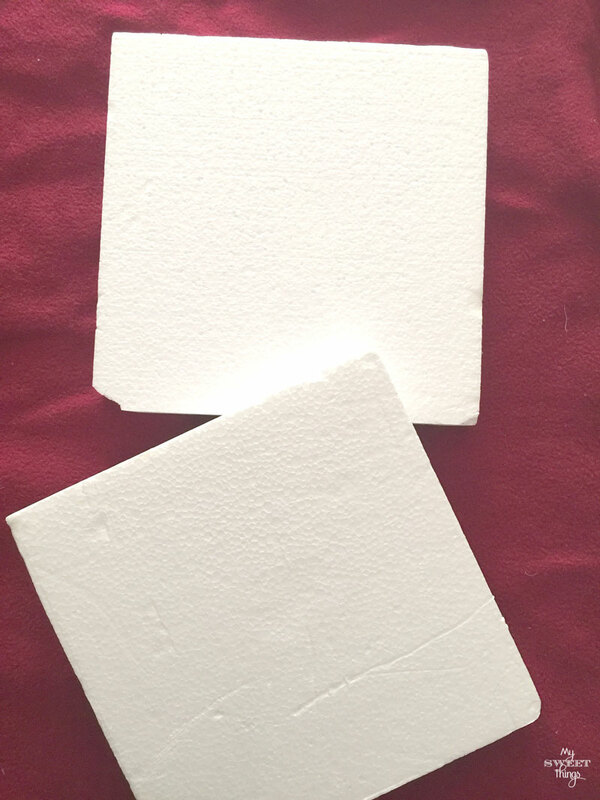 We printed some letters, cut them and traced them on the styrofoam. I cut them because I didn’t want the girls use that blade. 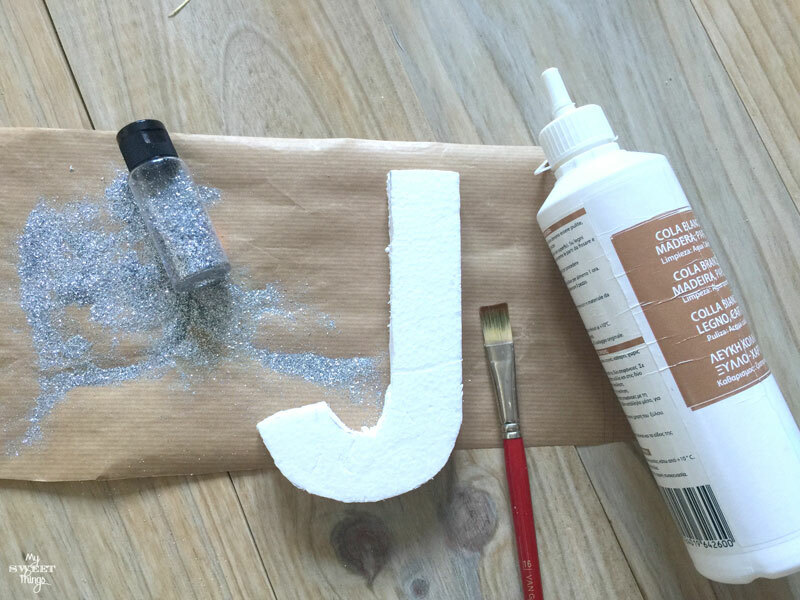 They brushed some glue on each letter and added some glitter. While they dried, we cut three pieces of cardboard and three pieces of fabric. Then we stapled the fabric on the cardboard and glued each letter to each panel. 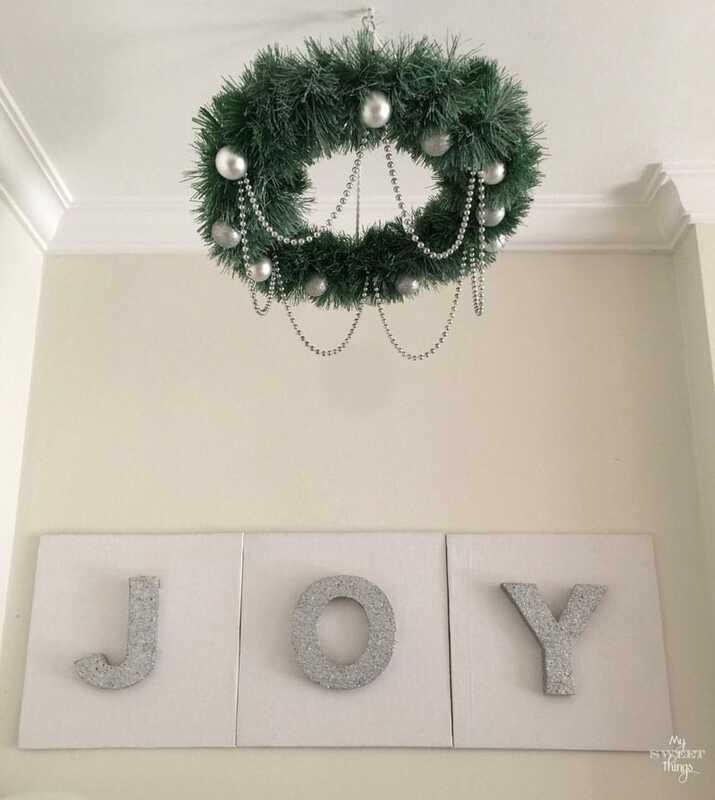 The wall was done and as we recently had made a wreath for our front door, I thought a Christmas kind of chandelier would be a great addition and would add extra sparkle to the corner. And it did, don’t you agree? We again used what we already had on hand. Yes, it may seem odd but we always have cardboard, the girls love to play and make forts with it! 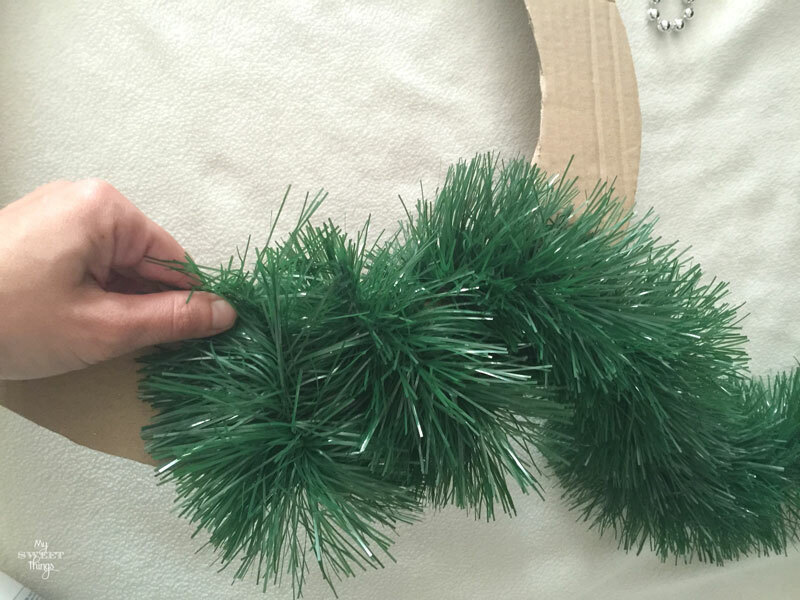 We wrapped the cardboard with the tinsel and then gave it a very light coat of spray paint. 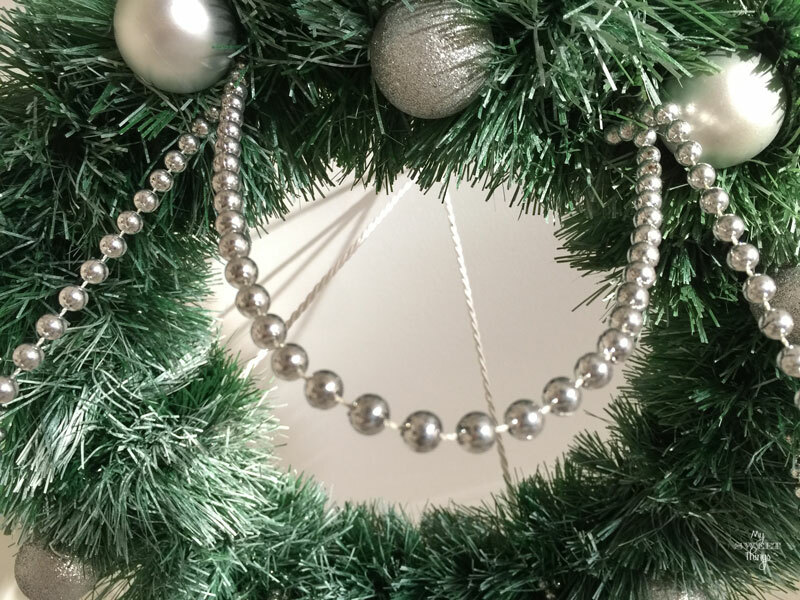 The pearls were arranged by threading them through the tinsel and letting them scallop. I did the same with the cord to hang it. I love this project didn’t involve any kind of glue and can be undone anytime. Now we have a sparkling corner! In case you want to see the rest of the living room, you can check it here. Don’t miss a single blog, just check out the link ups at the bottom of this post! I’m sure, you’ll love all the different ideas & styles and get inspired! Also, please watch for #homeforchristmas on social media and click on it, to find more exciting projects and decor! 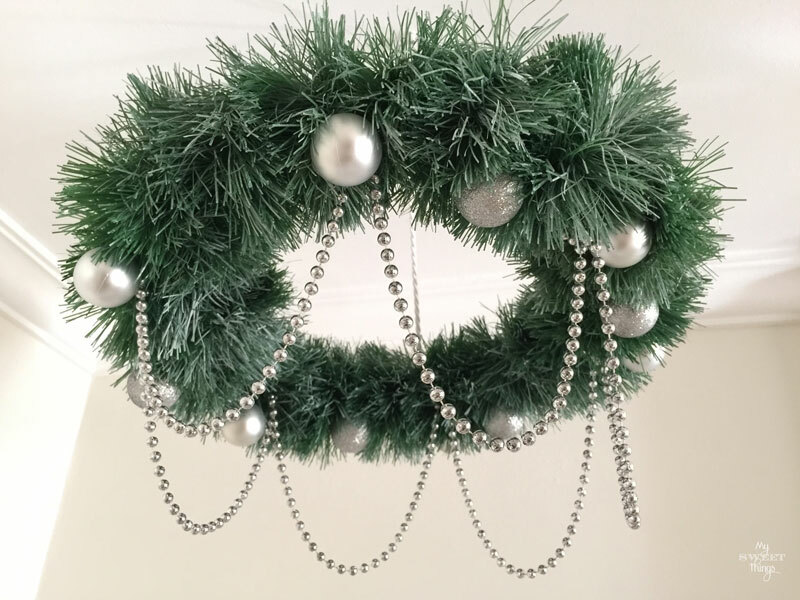 This entry was posted in DIY and tagged Christmas, Decor, DIY, home decor, Ornament, Tutorial. Pili, I love the JOY sign you made with your girls! I bet they had so much fun using all that glitter..lol. It looks very festive. And the chandelier you made is amazing, I love it! Green and silver is such a beautiful combination and the idea of making a chandelier is so creative!!! Thanks Katrin, we ended up happily covered in glitter!! 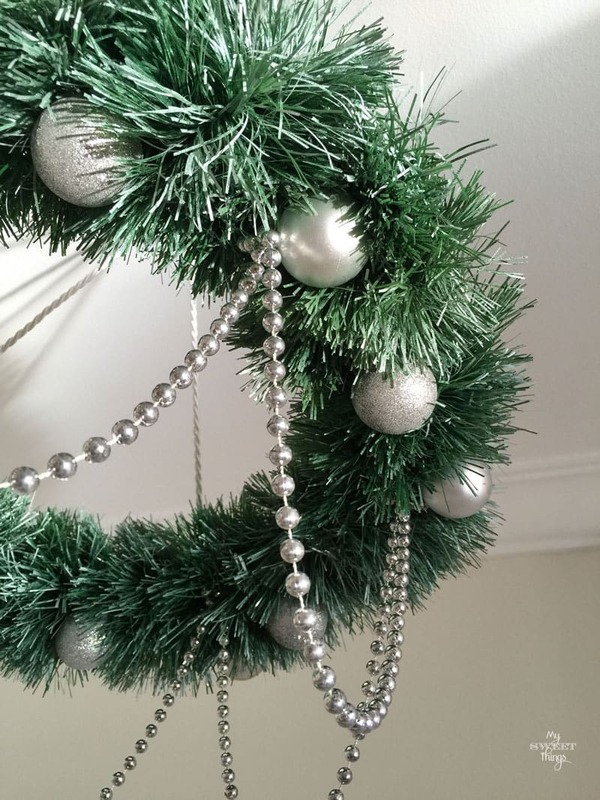 I really love the chandelier, as you say green and silver is a pretty combination… or at least I like it! I love love love that wreath!! It is so sophisticated and blingy and and… I’m losing my words. I like that you added the white paint to it , gives it a bit more wow. And the letters are very pretty too. Can’t wait to see what else you are going to create with those brilliant girls of yours!! Have a Merry Christmas. Our dining room gets dark at about 1pm because of the orientation, but I really like to switch on the lights and get that extra sparkle. 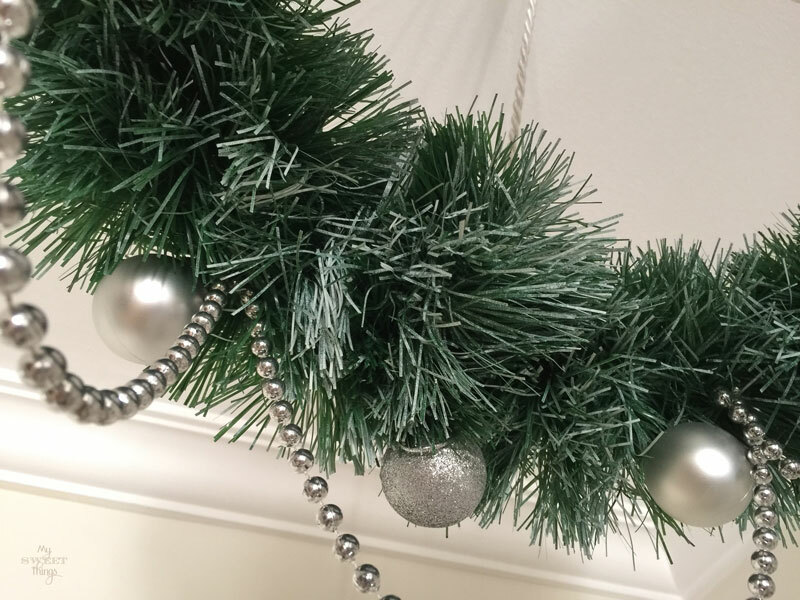 You did an amazing job adding Sparkle to the corner… two great ideas! Many thanks, Tammy!! Glad you like them too! 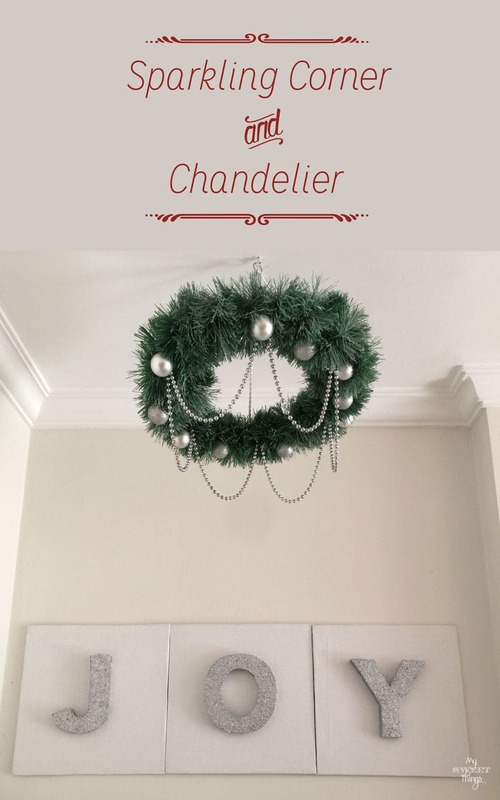 Cute sparkly sign – gorgeous Christmas Chandelier. Love the pretty bling! Pinned to share. You’re so kind, Marie! I can’t help it, I love sparkly things mixed with other shabby or romantic pieces. Welcome to my crazy corner! 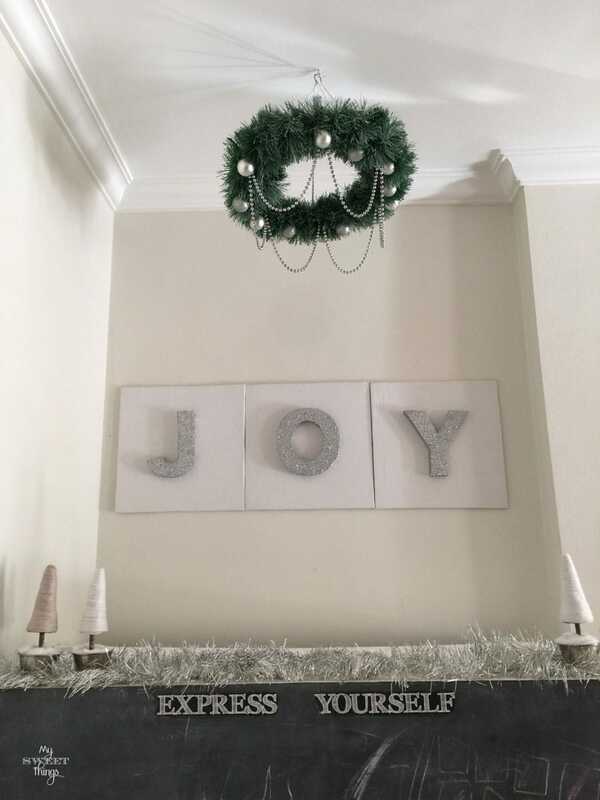 You made the pretties Joy sign and a nice Christmas decorations. Thanks for sharing this at Cooking and Crafting with J & J. Have a Happy New Year. Hi, Julie. We love to make pretty things for our home. Thanks for visiting, happy New Year! What does glitter have that we like it so much? I don’t know, but love this time of the year when the house is full of it. Thank you so much for visiting, Leanne. 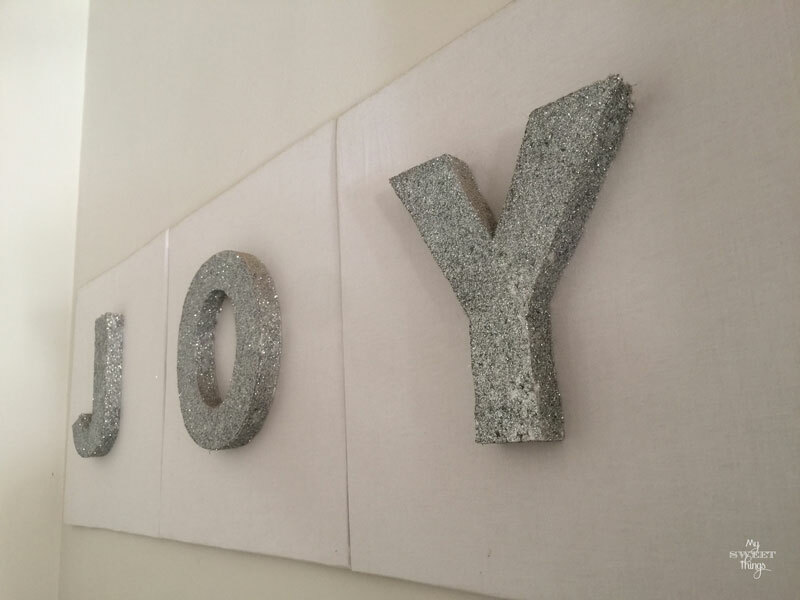 The Joy sign is so fantastic – I have the perfect space for something like this in my living room! Pinned! As you see it is really easy, and at the same time is a great (and cheap) addition to a lonely wall. Pili, this corner is so awesome. Who would’ve thunk that the letters were this simple to make? And they make such a big impact on the room. 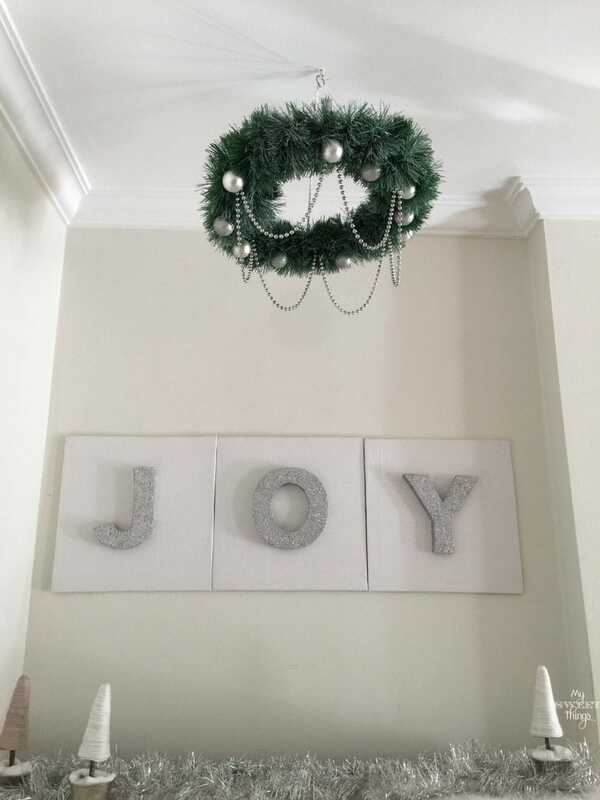 I really like that you chose the word Joy, I bet with the kids there’s a ton of joy during this time of year. I really want to know what the chalkboard is hiding, I love it too. Looks great! You know me Nikki, I really love an easy DIY! 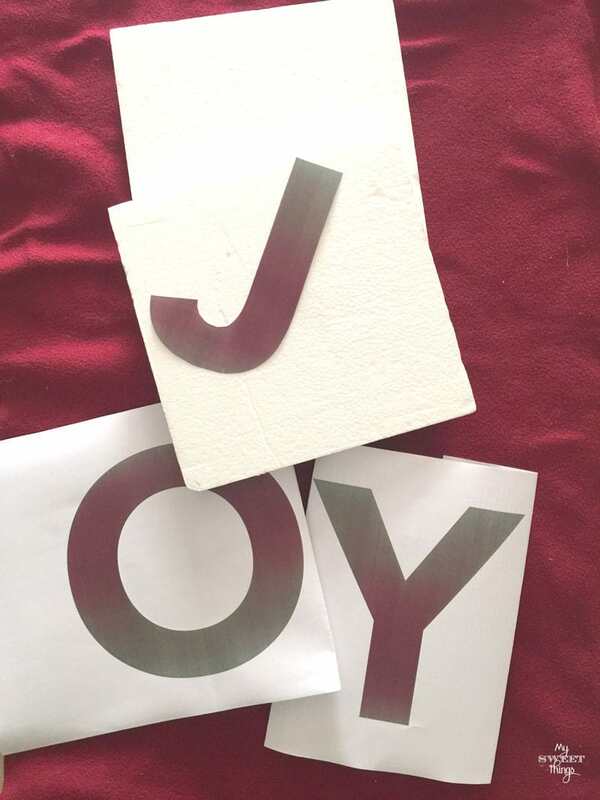 I chose the word Joy because it means a lot to me, we want to have joy in our lives; the girls dance and sing all day and I think that’s a sign of happiness, so we really have joy. You can use an image and no more than two lines of text with a link back to my site with no problem. Glad if I can be of any help making people recycling more instead of throwing away the stuff they don’t use anymore.